Last year a record 1,215 rhinos were slaughtered for their horns in South Africa - and at the same time, 42 poachers were killed by rangers and police. This bloody conflict is fuelled by the mistaken belief in Asia that rhino horn cures cancer, and it's growing more intense every year. "The gunman advances close to the animal, against the wind. He shoots. After if falls the other two join the killer, this time to extract the horn. Then we go to our hideout and wait for the cover of night before we walk to the border." Eusebio lives in one of many small Mozambican villages scattered along the South African border. It's a desolate, impoverished area. Most people live by farming small plots of maize and vegetables - but 27-year-old Eusebio had other ideas. "I met up with my friends to discuss how we could escape our lives of poverty. We decided to go and poach a rhino. First we went to see the witchdoctor to find out the safest route to take. Then we left home and headed for the mountains." There are no more rhinos in Mozambique - the last were killed two years ago - so his destination was South Africa's Kruger National Park, a pristine wilderness where animals can roam freely. It's home to the majority of the world's rhinos, which makes it the number one target for poachers. "We wait and watch the movement of the rangers and when it gets dark we walk long distances to a place where the rangers rarely go. There we sleep. At dawn we start the hunt. When there's no police around then you can kill it, but it should die on your first shot or it's dangerous. Cutting the horn is hard, but we in the countryside are used to cutting wood with a machete, so it's not difficult for us." Poachers usually work in groups of three. One shoots the rhino, one cuts off the horn and the other acts as a look out. Eusebio was the shooter on his four successful trips into Kruger Park, making him about $10,000 (£6,740) in total. This is a fraction of the value of a rhino horn in Asia, where, where - falsely thought to be a cure for cancer among other things, and an aphrodisiac - it can fetch $250,000 (£170,000). But to Eusebio it meant he could move his three wives and children out of their stick hut into a small house of brick and concrete, buy some cattle and set up a small bar. Though he's not proud of killing rhinos, he says his family might otherwise be going hungry. As the number of slaughtered South African rhinos has shot up - from 13 in 2007 to more than 1,000 in 2013 and 2014 - a whole industry to protect the animal has arisen. One example is Protrack, the first of a number of private anti-poaching security companies that have been set up in South Africa. "You've got heavily armed gangs coming in to kill," says its founder, Vincent Barkas, who hires out his rangers to private reserves in the Greater Kruger area. "We're teaching our guards to protect themselves, which unfortunately means teaching them to use a semi-automatic weapon, which can potentially kill a person." The rangers live out in the bush and sleep under the stars when on patrol. To protect themselves from wild animals they make little enclosures with the branches of thorny bushes and spend the nights inside them with the comfort of a small fire. Protrack's star ranger, Tumi Morema, who has caught more poachers than anyone else, says his wife is convinced he will be killed one day - either by poachers or wild animals. And the risks also follow him home. "I do get threats," he says. "On the street I meet people who say, 'Tumi we're going to get you.'" Despite this, he says he understands what drives the poachers, beyond poverty and greed. "Many years ago there weren't fences and then white people came and put up fences. Now they own the animals and black people feel like their access to the wild has been taken away," he says. "So they don't respect it. They feel like they've been robbed. That's the biggest problem. That's what causes poaching." One of the 42 poachers killed in South Africa last year was Eusebio's younger brother, Sebastiao. He left behind two widows, two children and heartbroken parents. Until last year poaching was not even a crime in Mozambique, and there still seems to be a reluctance in some quarters to stop the lucrative trade. "The police and soldiers bring the weapons here for us to go and poach," says Eusebio's father, Jeremiah. "So the first step is for the government to stop the police and soldiers bringing guns from the capital Maputo - but if the guns continue to come here, our children will continue to go poaching because they have nothing else to do." Police even compete to be deployed to poaching areas such as Massingir and Magude, over the border from the Kruger National Park, says Mozambican journalist Lazaro Mabunda, because "this is where they can make a fortune out of poaching". "Those running illegal hunting have practically neutralised state institutions," he says. "That's why you hardly find cases of people [convicted] for rhino poaching. On the contrary they are the most protected people by the state." Mozambique's head of conservation, Bartolomeu de Soto, acknowledges that the number of rhinos being killed is rising, but he says poachers have been arrested, and it's because the law was only passed last year that there have been no convictions so far. He says this issue is a priority for the government, and that "if there is a case of corruption, the government acts". But he accepts that poverty - one of the root causes of poaching - won't be eradicated soon. On the other side of the border, the man charged with stopping rhino poaching in Kruger National Park, Maj Gen Johan Jooste, says he knows that killing poachers is not the solution. "Poacher will always replace poacher unless you take out organised crime, the big bosses," he says. "You must also give the community hope. You must demonstrate that you have control over the crime network and then come with a benefit that they'll get in the long term. The future of our parks lies in the hand of our communities and them benefiting from the wildlife economy." 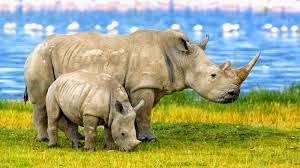 Most rhinos are killed for their horn, though some are tranquillised while the horn is hacked off. But how do you treat an animal mutilated in this way? No-one has had to do it, until now. "The biggest challenge is the size of the animal, and the fact that very little post-operative care can be done," says wildlife surgeon Johan Marais. "We have to immobilise the rhino with the facial wounds every four weeks for up to 12 months, which is a risk every time for the animal as well as a financial burden for the owner. However, it is something that needs to be done to save these animals' lives." 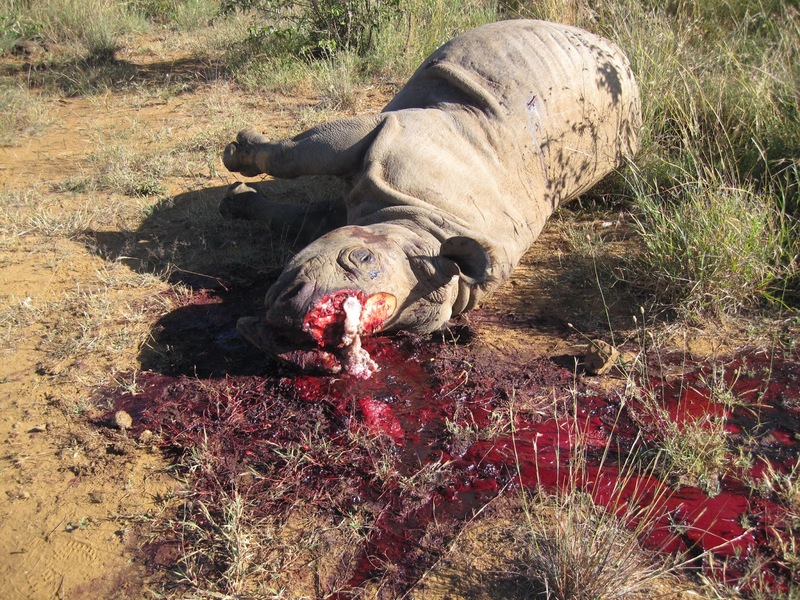 This rhino, called Lion Den, had her horn and part of her face hacked off with a chainsaw, and was left wandering the bush with blood pouring from her fully exposed sinuses. To keep flies out, vets covered the wound with a cast made of fibre glass, but the rhino began to damage it while scratching on tree trunks. Another solution had to be found. What they came up with was rather surprising. They decided to fill the wound with the material used for dental plates and sew it on with dental wire, filling in any gaps with superglue. Skin was also taken from behind Lion Den's ears and sewn on to her face - the first ever skin graft performed on a rhino. It has so far proved successful and Lion Den is slowly recovering at the Hoedspruit Endangered Species Centre. There was, however, one casualty. Lion Den was pregnant when attacked and the trauma meant she lost her calf.